I started out by finding a picture of Thwomp that I could use to create a template, a quick online search and I found the perfect one. Once I had a good picture, I decided on a size and the final measurements came out to be 15 5/8" tall x 14" wide x 7 1/2" deep. I printed out a picture of Thwomp in my desired size and began making a cardboard mock up of the mold. I knew I wanted to make the mold box out of wood but it was easier for me to do a mock up first so I could figure out all the pieces I needed to create. 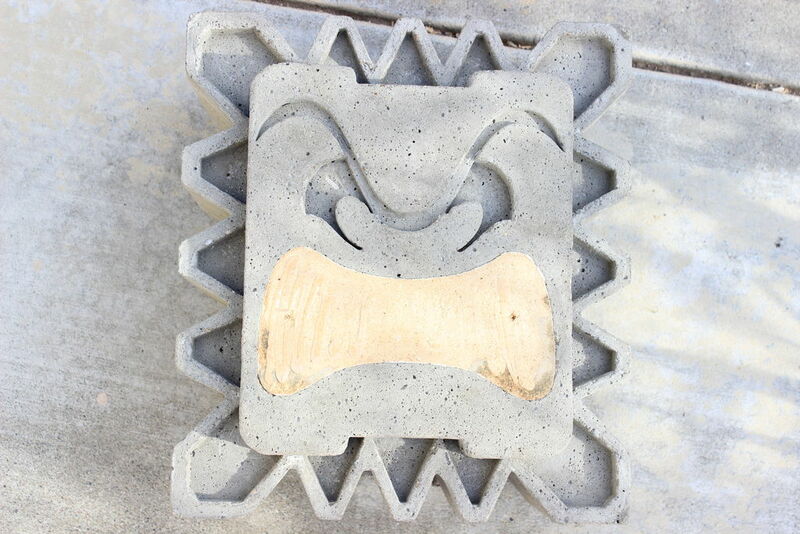 I designed the mold as a box, and created pieces to fit inside so that once concrete was poured in they would create the Thwomp face and spikes. I created pillars which I positioned around the sides of the box to create the spikes on the edges. I created a border for around the face so that the face would end up sticking out about 1". Then I created the pieces for the facial features, this took me a minute to figure out because I kept getting confused on what needing to stick out and what needed to be indented in the concrete : ) but I ended up realizing that any piece I created to go in the mold box would end up being indented in....so simple now! After I created the cardboard mock up and figured out all of the pieces I needed I designed a clean template in illustrator. I altered the shapes of the spikes so I could cut the pillars using exact degrees and finalized the design. Then I used spray glue to attach the template to some poster board so that it would be nice and thick, I really don't like flimsy pattern pieces... : ) but that's completely optional. Then I cut out all of the pieces and was ready to get going to the wood form! * I ended up modifying the corners of the Thwomp to square them off to make the mold box a little simpler and easier to work with, the template is updated with the squared corners. To create the facial features and spikes I started by transferring my template to the particle and MDF board. I used 1/4" MDF board for the eyebrows, I didn't want them to be as deep as the rest of the facial features. Once I traced the eyebrows to the MDF board I used a jig saw to roughly cut out the shape so it would be easier to cut in the bandsaw. Then I used the bandsaw to cut out the eyebrows, keeping the blade on the outer edge of the pen mark and cutting very carefully around the curves. Next I traced the mouth, eyes and spikes on the 1/2" particle board. Once traced I roughly cut these pieces out with the jig saw. The last step was to add the teeth detail to the mouth. I cut the teeth out of the mouth pattern piece and transferred the pattern to the mouth piece. Next I clamped the mouth piece to my table and I also clamped a shop-vac right next to where I was working to catch some of the wood shavings. *The router was super messy to work with so I would definitely recommend using safety glasses and a dust mask*. I used a 3/4" straight bit for the first round to router out as much of the teeth as possible, and I set the depth to about 5/16". Then I used a 1/8" straight bit to define the corners and square them off. *I used a 1/8" blade on the bandsaw which made it a lot easier to cut out the curves. To create the face frame I started by cutting out 2 rectangle pieces the size of the Thwomp, which measured 14" X 15 5/8", from the 1/2" particle board using a table saw. Next I glued the 2 pieces together. I started by tracing the face frame to one board so I would know where I needed to apply the glue. I applied a bead of the Liquid Nails Glue to the board and spread out the glue using a paint stirrer. Then I added the 2nd board, making sure to line up the edges and pressed them together. Then I added some screws to make sure the boards would be secure. I clamped the boards to a table and added screws to the spikes. I pre-drilled all of the holes since the particle board can crumble fairly easily. Since the screws were a bit to long, I used a grinder to grind them down and smooth out the back side. Next I cut out the spikes. I used the bandsaw to cut them out and this was a lot easier for me to use instead of the jig saw in order to create straight lines. The last step was to glue on the small spikes to the face frame. Adding these will create a little wall around each spike so it looks like the real thing. You just want to add the small spikes to the correct spike on the face frame. I added hot glue to the back sides of the small spikes and pressed them into place. *I wanted the face frame to be 1" thick so that the face would stick out 1". You can always adjust this size as desired. I used 2 pieces of wood glued together because it was more cost effective but you could also use a piece of 1" thick board and skip the gluing process. * I originally cut the corner tips of the face frame in order to get the Thwomp to look as accurate as possible, but didn't find a good option when trying to add this to the mold box and ended up squaring them off in the mold box. To build the mold box I started out by cutting the pillars (to create the spikes) out of a piece of 2X8 using a chop saw. The chop saw was adjusted to the correct angle for each piece. The cuts needed are: 4-25X25, 4-25X40, 4-25X45, and 4-30X30. The next step is to cut out the pieces to create the actual box. I cut these out of a piece of 3/4" particle board, and the cuts needed are: 1-14"X15 5/8", 2-14"X8 1/4", and 2-17 1/8"X8 1/4". Once the boards are cut, you can screw them together. I started by clamping the base to a table and screwing on 1 side at a time. I pre-drilled all of the holes to keep the particle board from crumbling apart. Once the box is screwed together you can add the face frame to the bottom. The face frame should be positioned with the small spike layer facing up. I added hot glue to the back side of the frame and pressed it into place on the bottom of the box. Next I added the pillars in between the spikes. I matched each pillar to the correct position (you can reference the pattern for this) and used a speed square to keep them straight. I screwed the pillars to the mold box and pre-drilled all of the holes. The last step was to give the box a quick sanding to make sure it was as smooth as possible. * I had my pillars cut and ready to go for a few days and they got warped from the heat so I soaked them in water to straighten them back out. This worked great and I was still able to use them. *You want to make sure to check if the pillars will lay flush against the edge of the face frame before gluing the frame to the bottom so you can see if everything will fit properly. To attach the face I started by calculating where each piece needed to be positioned on the bottom of the mold box. I began by drawing a line down the center so I knew where to position each piece. I started with the eyebrows. I measured from the center of the eyebrows and marked there position at 3 7/8" down from the top. Next I added hot glue and pressed them into place. Next I added the eye pieces. I measured from the top of the eyes and marked there position at 2 3/4" down from the top. Then added hot glue and pressed them into place. The last piece was the mouth. I measured from the bottom center and marked the position at 2 3/16" up from the bottom. Then added hot glue and pressed them into place. To prepare the mold box I started by adding caulking to all of the corners and cracks. I applied a small bead strip of caulking at a time, wet my finger in water and then smoothed it out. The water kept the caulking from getting tacky and made it easy to manage. I also used a small brush to get into the tiny cracks. I kept a rag nearby to keep my fingers clean and wipe off any extra caulking. Next I created a wire frame to insert into the mold to help retain the structure. I used concrete tie wire to create a grid frame. Once the caulking was dry I added a sealer to complete the mold. I used clear spray shellac and sprayed the entire inside, and let it dry completely. Now the exciting part...pouring the concrete! I started out by spraying on a layer of coconut oil to use as a mold release. I have seen a lot of different options to use as a mold release but I had this on hand so that's what I used. The next step was to mix the concrete. The mold box needed about 1 and 1/3 of 60lb bags of concrete to fill it, so you could probably also just use 1 80lb bag. I added 1 bag of concrete at a time to the 5 gallon bucket and then added water. The mix needed around 3/4 of a gallon of water per 60lb bag, but this will depend on the concrete mix you use. I mixed the concrete using a drill and a paint mixer until everything was thoroughly combined. Next I added a layer of the concrete mix to the mold box. I filled in a few inches and then added the wire frame, being careful not to press the frame down so it wouldn't sink to the bottom and show on the face. I shook the box a little to settle the concrete and then began filling in the rest of the mold box. Once I got to the top I used a few different sized trowels to smooth out the surface. I also used a palm sander, without the sand paper, on the outside of the mold box to vibrate out any air bubbles. * The 5 gallon bucket I used ended up busting open during the final mix, so if you are using a bucket as well just be careful not to press to hard while mixing. I had originally intended to preserve my mold box so I could get some more use out of it, but ended up having to take it completely apart. I had poured my concrete on a hot day and it started to show some cracks on the back side so I added a few doses of water to moisten it back up. While this definitely helped the concrete, it soaked my wood frame and and when I started de-molding the wood began to crumble apart. I started the de-molding process by unscrewing all of the screws around the box, then taking off all of the walls and pillars. Next I removed the face frame. The hot glue on the small spikes and the face did not hold, so these pieces were still stuck in the concrete. I used an awl and a few different sized chisels to remove all of the small spikes and the facial features. This part was pretty tedious but luckily I was waaaaaaaaaay to excited to reveal the Thwomp to worry about it! I had a shop-vac on hand to vacuum up the bits of particle board as I went along. * These are the steps I took for my mold box but if you secure the facial features and small spikes with something stronger than hold glue, and allow a longer curing time, than the de-molding process should be a lot easier. After de-molding the Thwomp, there were a few areas that needed to be cleaned up and sanded down. I used a chisel on the corners that had a little excess concrete sticking out. Then used some sand paper to smooth out any rough areas on the surface. The most exciting part! Painting the facial features! I used a medium size brush for the larger areas and a small brush to get into the tiny cracks. I painted the face on my Thwomp so that he would look like the real thing. I started by adding the black to the mouth and the eyes. Next I added the white to the teeth and the eyeballs. The white needed a few coats to really pop. Lastly I finished with the black pupils. For the paints, I used what I had on hand. The bottles say they are for multi-surface and work for indoor/outdoor. Why doesn't Nintendo manufacture and sell these things? Mind if I create a youtube video covering this build? I will of course give you full credit... Thanks! Your Yoshi nursery is SO awesome! I love it! Thanks for reaching out, let me know when you finish! I want to seeee! These would look nice in a garden. Thank you are sharing this awesome project! Thanks! !vMust someday make a full nintendo garden....! Glad you liked the project!! Wow really awesome can you maybe make a simpsons thing? i used 1/2 inch plywood rather than particle board and had few issuess with water absorbance and demolding. Also, as a tip, I flattened the sharp end of a screw and drilled it into each of the facial features. This pushes the screw into the hard cement, because the screw is flat, it has a hard time penetrating the cement and instead, the wooden feature rides up the screw as it spins! it worked excellently! Occasionally, the peice did not come out straight and by putting pressure on the higher side and there by squaring it out, it slid out just fine!